ChromaVision Medical Systems (Nasdaq:CVSN), located in San Juan Capistrano, California, knows what it takes to design and build a high-end vision inspection system. The ChromaVision ACIS® is the leading cellular imaging system in clinical use today. 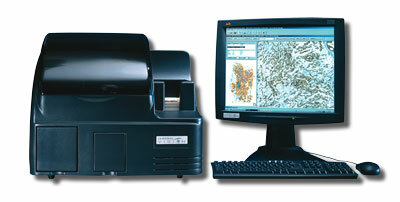 The ACIS® system combines a powerful, automated microscope platform with highly sensitive color recognition software. The ACIS® is designed to provide precise and accurate information to physicians and researchers, leading to consistency, quantization and standardization not possible with other methods - reducing the likelihood of errors in patient treatment and reducing healthcare costs. To help accomplish its incredible tasks, the ACIS® relies on a precision PCI-based motion control board from Varedan Technologies. The board controls all 8 axes of motion in the instrument, while sending and receiving I/O signals from sensors mounted on its stages. Varedan Technologies developed the controller with the ACIS® end application in mind. Since the ACIS® was a mature product, our engineers worked closely with the engineers at ChromaVision to ensure 100% backward compatibility with existing hardware. The controller also saves ChromaVision money - value that translates directly to the bottom line. "Varedan Technologies worked closely with our engineers to insure the design was not only robust, but would allow us to re-use much of the existing software base, an important consideration in our software intensive device." Time to market was also an important consideration, since the sooner the controller was in use, the sooner ChromaVision could begin saving money. "The controller went from concept to prototypes in about 6 months. We had instruments running with their board within a very short amount of time." Reliability and product support are paramount in the medical industry; ChromaVision can't afford to have an instrument down for any length of time. "Varedan engineers are always available to answer any questions. Product reliability has been excellent thus far. Based on the amount of testing done before we receive the product, we're confident that we are receiving a quality product every time. We are very happy with the relationship we have established with the team at Varedan Technologies." Jose and Aaron successfully led the engineering effort to incorporate the controller into the ACIS® system. ChromaVision Medical Systems was renamed Clarient, Inc. in 2005 and subsequently the ACIS® product line was purchased by Carl Zeiss MicroImaging in 2007. Machine speed, throughput, and reliability are critical to success in the ultra-competitive circuit-board assembly industry. As a leading provider of stencil printing equipment, Speedline Technologies of Franklin, Massachusetts, understands what it takes to stay ahead of the competition - continuous improvement of their products using state-of-the-art technology. 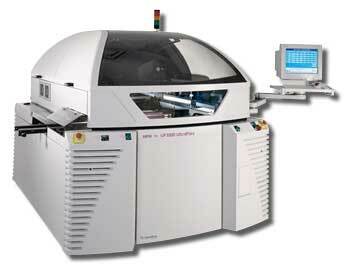 At the heart of each stencil printing machine is a controller card responsible for insuring accurate, high-speed positioning of between 4 and 32 axes of motion. The engineers at Speedline Technologies determined that their existing controller card needed to be replaced. They wanted a product based on the newest technology currently available. They wanted one that would provide a platform for future growth, while maintaining 100% compatibility with their existing product line. Their pursuit of a suitable replacement led them to Varedan Technologies who provided a product that not only gave them the performance necessary for the next generation of screen-printing machines and beyond, but also was a seamless replacement for the existing product. Varedan Technologies delivered working prototypes within 3 months. Over two years of continuous cycling, at extended life temperatures, Varedan's product has proven to be extremely reliable. The excellent support provided by Varedan Technologies has proven to be crucial in bringing this new card to market. The improved technological design was delivered without any additional cost over the outdated card. Varedan Technologies contributed to Speedline Technologies' competitive advantage by delivering a technologically superior product which met their design specifications, backed up by legendary service and support.